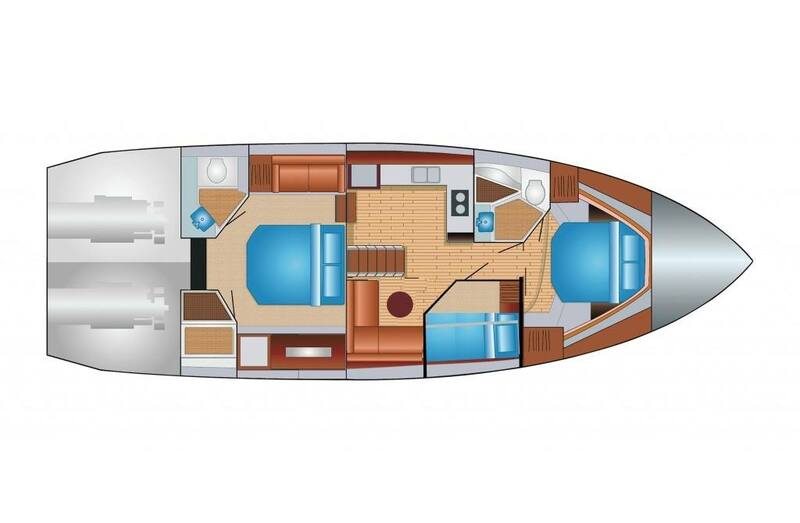 Full-Beam Master Stateroom: The aft Master Stateroom on the 53 has a sprawling layout with full single level walk-around space. 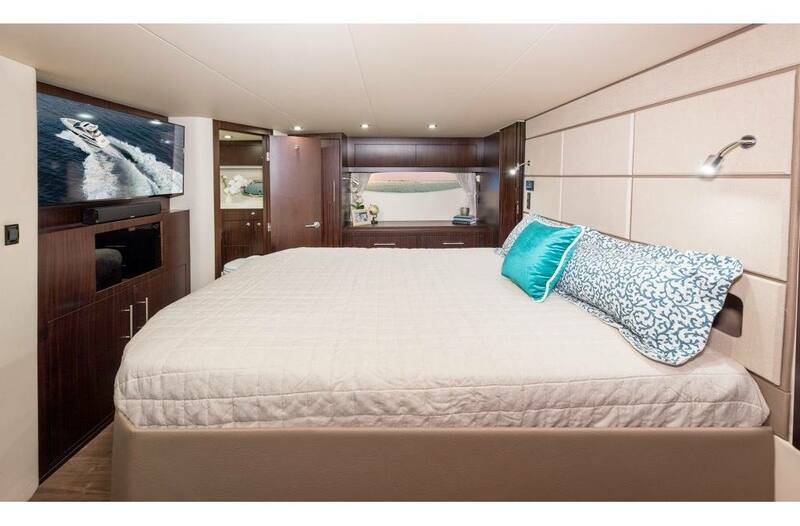 The master features an Olympic Queen size bed and more than enough storage for all the amenities for a week long trip. Single Level Cockpit Sole: No need to separate the guests or the party. The single level cockpit sole keeps everyone on the same level and in view of the fading horizon. Glass Cockpit Enclosure: The only canvas a boater likes is one that is framed and hung on a wall. The glass enclosure puts canvas where it belongs: in a museum. 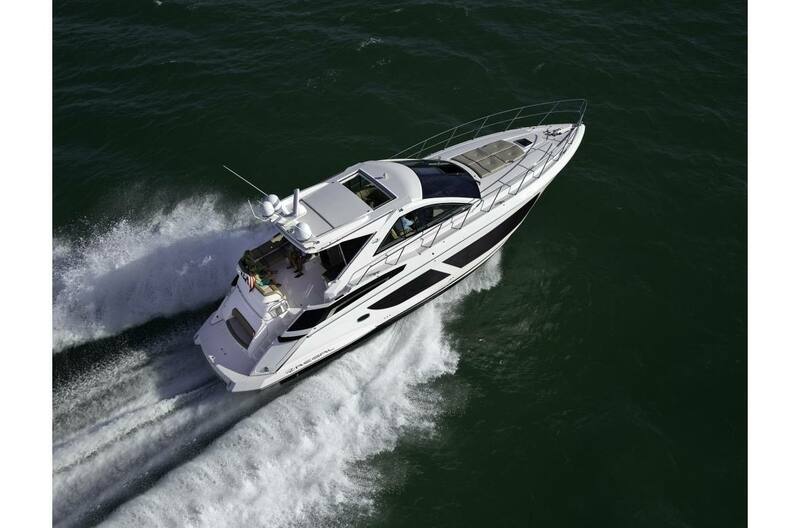 Performance: Through superior hull design, production methods, and new light materials, Regal is able to achieve performance with twin installation that rivals competitors' 53-footers with triple installations, giving you less weight, draft, engine maintenance, 1/3 less fuel consumption and more engine room space. 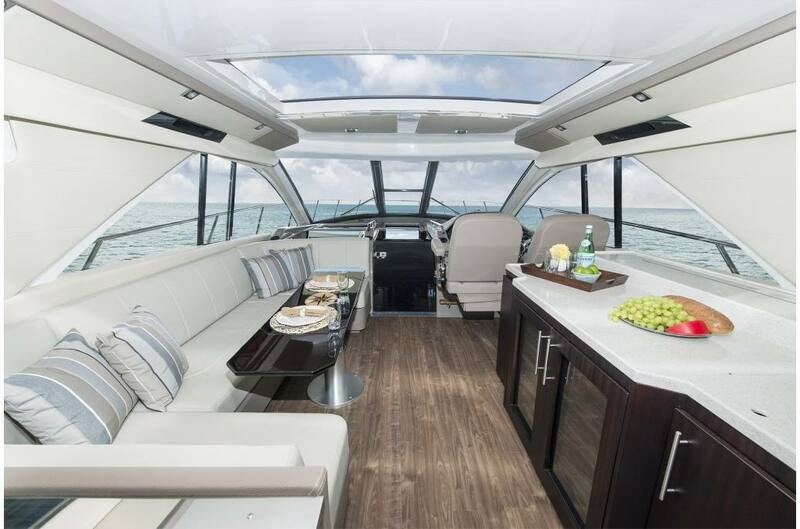 Aft Patio Seating: The large aft patio seating is perfect for entertaining. 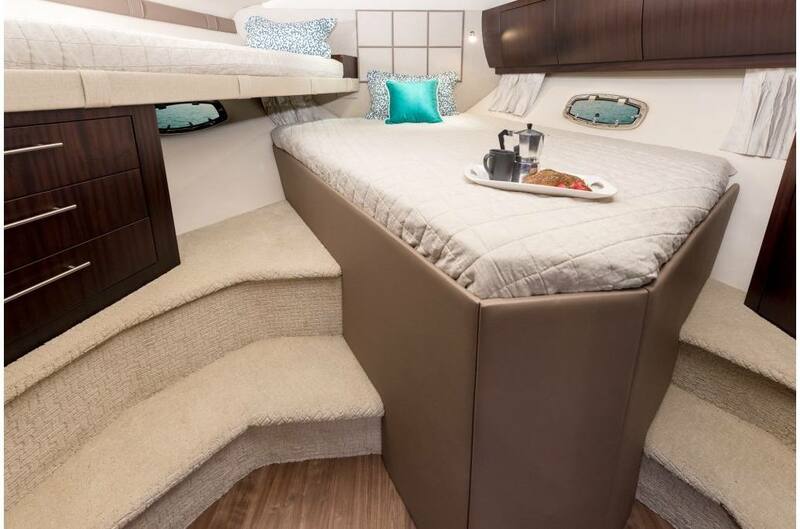 Custom Stateroom Configuration: Customize your 53 Sport Coupe with multiple stateroom configurations, including a third stateroom option with twin bunks, giving the family more flexibility when it comes to the sleeping arrangements. 36,000 BTU Air Condition: The 36,000 BTU air conditioning system will keep the cabin cool even on the hottest of days, or use the reverse cycle heat on the cold ones. Automatic Bilge Pumps: The two automatic bilge pumps take action before you even realize you need them. Autopilot for Zeus: Smooth cruising with advanced Zeus autopilot. Central Vacuum System: No need to give up storage for a vacuum; your Regal has one built in. Battery Charger: The standard battery charger will keep your starting and house battery fully charged when you have the shore power plugged in. 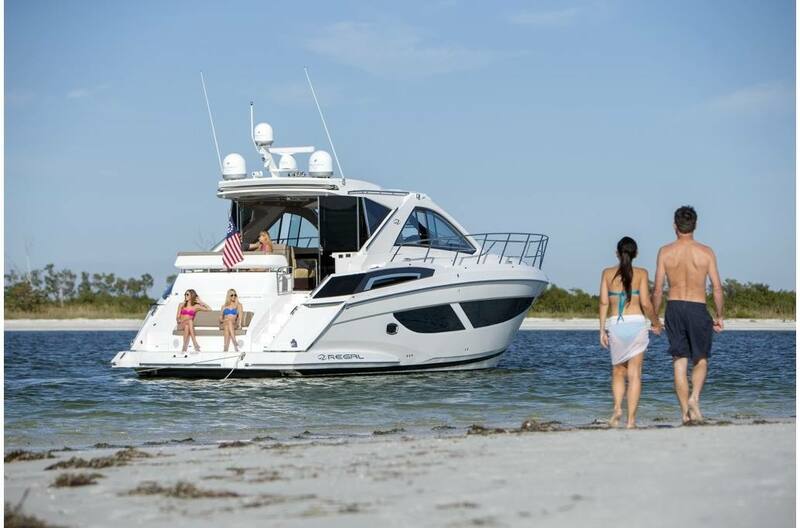 Dockside Power - 50 amp: With a single 50' 50 amp dockside cable, your Regal will be powered up and all system ready to go. Cruise Package: The standard cruise package means your next Regal comes complete with fenders, dock lines, life vests, first aid kit, boat hook, and deck brush. Garmin HD Open Array Radar: Sharpen your radar picture with high definition performance. Engine Room Wash Down: You'll appreciate the standard engine room wash down when it's time to give the engine room its yearly cleaning. LED Indicating Trim Tab Controls: The trim tabs give you complete control over your boat even in rough seas. Water Tank Fill Valve: Getting the hose and holding it to the fill can be a pain. Hook up your dockside water, flip the valve and your tank will fill. 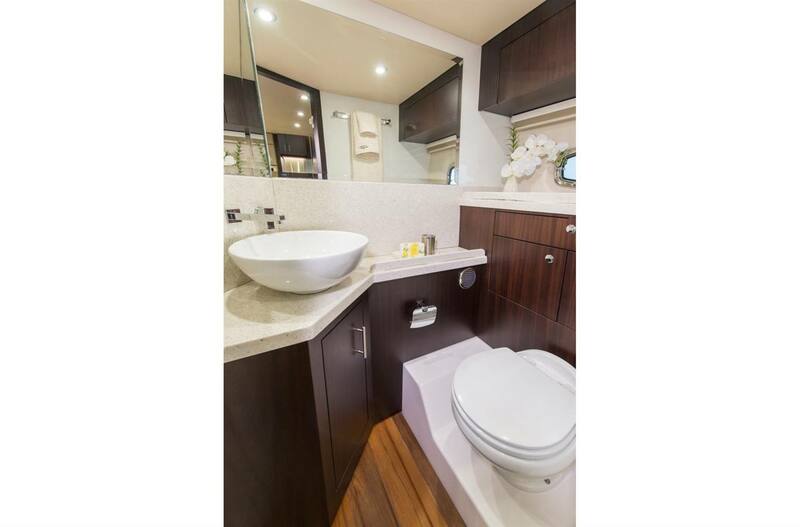 Water Heater: Hot water is a must for your weekend outing and it comes standard on a Regal. Electric Head: You can always expect the latest technology from Regal. Case in point: a standard silent flush electric head instead of vacuflush. Glass Vessel Sink: The glass vessel sink is a perfect example of the form and function that defines your Sport Coupe. Stainless Towel Rack: The amenities of home: a dedicated towel rack to dry your wet towels. Separate Shower: The split shower will be appreciated time and time again. Teak Floor and Seat: The rich look and feel of teak gives the shower a different feel. Carbon Monoxide Detector: Safety is standard on a Regal. Case in point: the cabin carbon monoxide detector. Olympic Queen Berth: Perfect spot to end a perfect day. 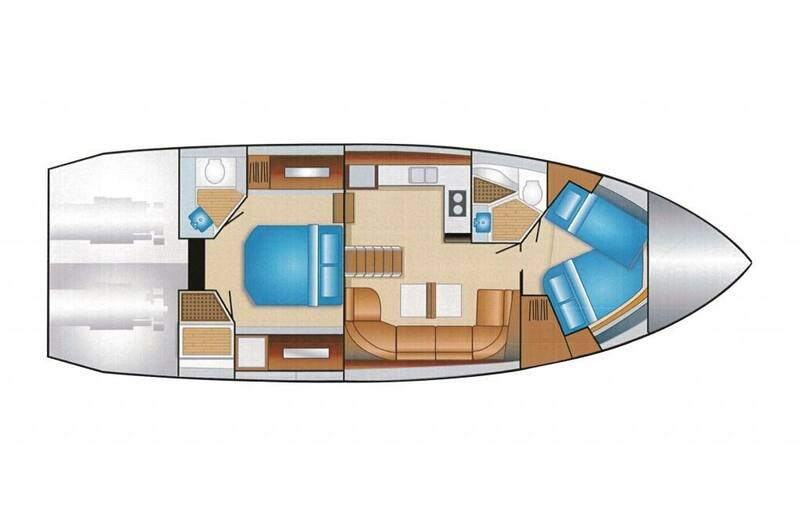 Full-Beam Master Stateroom: The aft Master Stateroom on the 53 has a sprawling layout with full single level walk-around space. 6' 11" Headroom: If the headroom at the helm wasn't enough, Regal gives you 6" more in the salon. Dishware and Flatware: Your Regal comes cruise ready. No need to buy dishware or silverware. Electric 2-Burner Stove: Everything you need to make a gourmet meal. Microwave: Regal galleys feature all the amenities you would come to expect, including a full-size microwave convection oven. 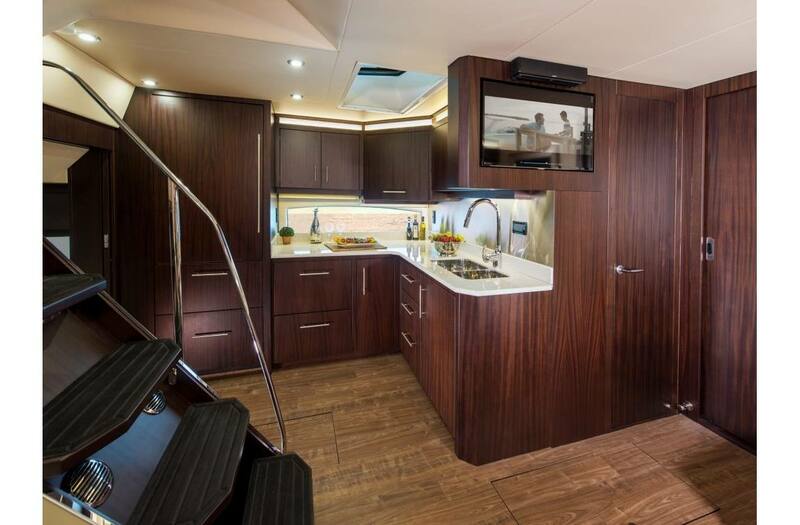 Full Sized Refrigerator: The full sized refrigerator speaks not only to the boats usability, but its luxury as well. Storage Drawers: The 53 has all the storage you need. 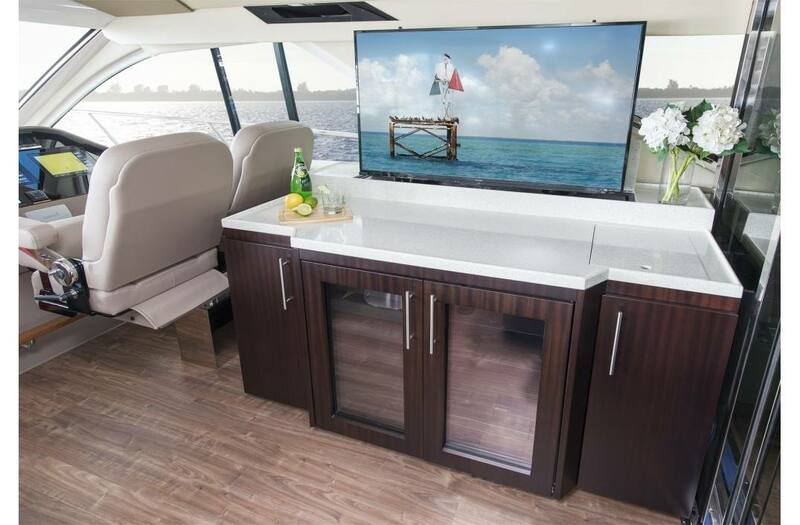 Entertainment Center: The TV may be an afterthought on many boats, but the Hardwood entertainment center with 32 inch TV, reminds you why you bought a Regal. Bose CineMate GS Series II Theater System: The Bose Home Theater sound system will liven up the cabin with the best sound. Fusion 700i Stereo Remote: If you want to listen to the same tunes through your entire boat, then only Regal has you covered. Turn on the cockpit Fusion, set your Bose system to AUX and control everything from any of the Fusion remotes. 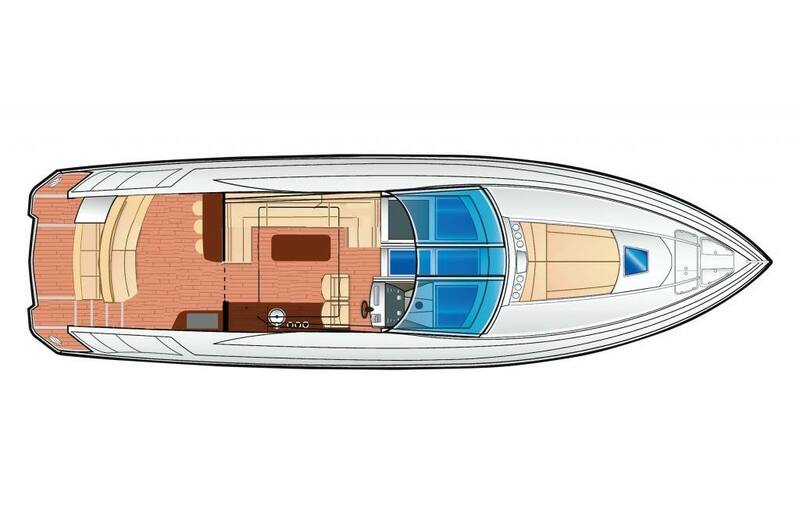 Hull Side Windows: The hull windows on your 53 Sport Coupe are so big you almost forget you're in the Salon. Overhead Accent Lighting: The accent lighting shows Regal's designers don't overlook the details. Overhead Cabinets: The dark cherry cabinets not only look great, but the gas rams make them functional as well. Cockpit Carpet: The standard cockpit carpet will make the cockpit of your Sport Coupe feel like home. Chart and Accessory Locker: You will never have to worry about where to put your charts, binoculars, cell phones, etc, the port side locker has you covered with ample storage. Engine Room Day Hatch: The day hatch provides for quick access to the engine room for quick morning check. Fusion Marine Sound - Stereo Performance Package: The best sound begins with the best equipment. That means six 200 watt Fusion cockpit speakers with an IP65 waterproof rating, 400 watt sub woofer, and amplifier. Glass Cockpit Enclosure: The cockpit enclosure gives you a complete canvas free experience. Sunroof: The 41" by 78" sunroof allows you to adjust to the weather with a push of a button. Transom Seating: The transom bench seat brings you as close to the water as you can get without getting in. 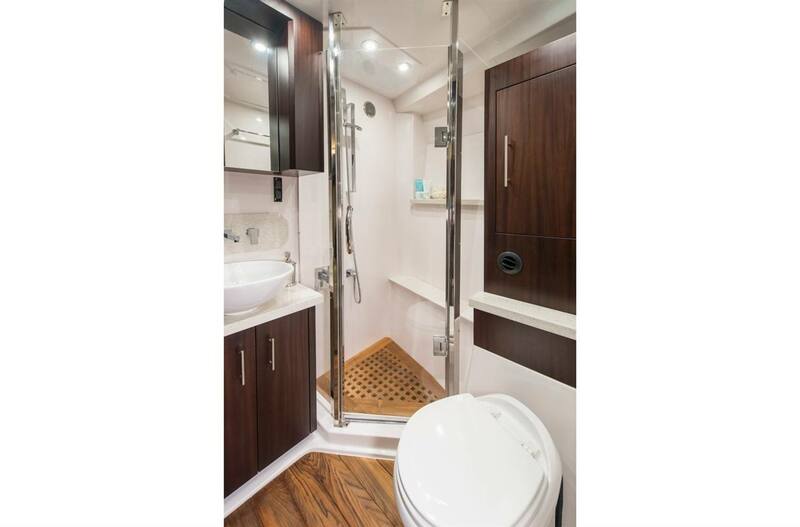 Transom Storage Locker: The transom storage locker allows for easy storage for all your boating necessity. Upper Salon Seating: The attention to detail and plush sofa turns the upper salon, into the ultimate seating area. 6' 5" Headroom: Your 53 Sport Coupe may have Italian lines, but the full standing headroom reaffirms your decision to buy American. Compass: A standard compass will help keep you on course at all times. Fusion Marine Stereo: The Fusion radio has full integration for your smart phone, which can be enclosed in a waterproof uni-dock, and has AM/FM radio. 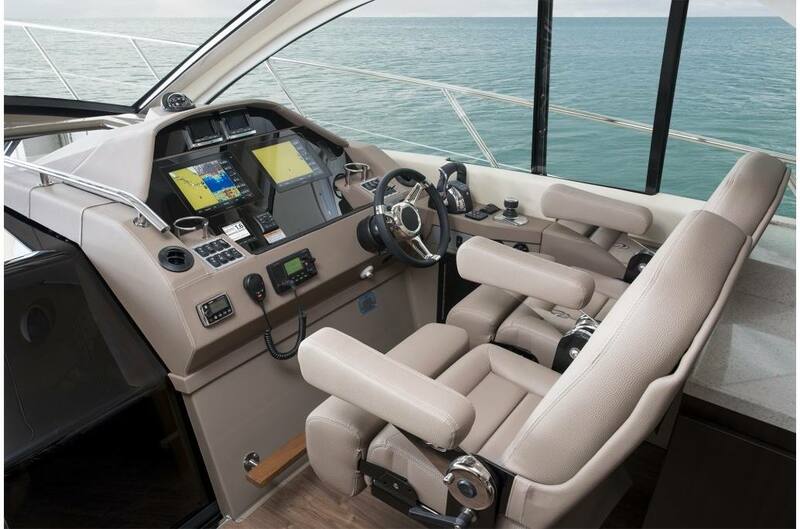 Dual Commander Helm Seats: The dual commander helm seats make you feel like the captain you are. Garmin 8212 Chartplotter: Enjoy the latest technology with the standard 8000 series Garmin. Garmin VHF 200: The premium Garmin VHF 200 is perfect for communicating with other boaters and local marinas. Hand Wrapped Steering Wheel: Many manufacturers take a shortcut when it comes to the steering wheel, but Regal isn't about shortcuts. Teak Footrest: The teak footrest is the perfect compliment to the Commander helm seats. Windshield De-Fog System: If you have ever had to deal with a fogged windshield, you will really appreciate this feature. Anchor Bay: The first mate will enjoy the flat foredeck when working the anchor or bow lines. Bottom Paint: Don't let bottom growth slow you down. Bottom paint is standard on Regal Yachts. Anchor Roller: Your next Regal comes standard with an anchor roller and stainless steel guard plate to keep your foredeck free of scratches. Anchor Windlass: The standard anchor windlass makes anchoring and mooring a breeze with the standard foot pedals. Dockside Water Inlet: Keep your water tank full. You never know what the day has in store. Foredeck Fender Lockers: You will appreciate not having to walk your fenders to the back of the boat. Foredeck Wash Down: You'll appreciate the standard foredeck wash down when it's time to give your yacht a good scrub. Navigation Lights: Regal never compromises on safety. The Navigation & Anchor lights are standard on all Regals. 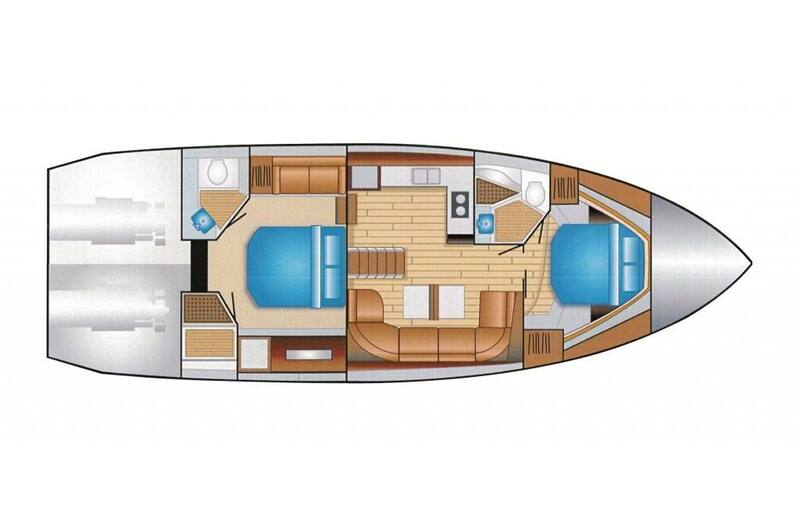 OceanTrac Hull Design: A unique and individually designed hull that balances the load of the ships systems, allowing it to turn tight, track straight and handle seas with precession. Stainless Cleats: Regal features eight 12" stainless steel cleats which won't rust or break over time. Stainless Claw Anchor: Regals feature premium stainless steel claw anchors, which work well with all kinds of bottom terrain. Includes rope and rode. Swim Platform Cleats: When ready to tie up in the slip, two 8" swim platform cleats pop-up and will keep your lines free from crossing your swim platform. Trumpet Style Horn: The trumpet horn is louder than a traditional horn. Windshield Wiper: The starboard side windshield wiper will keep you cruising in all weather. Air Conditioning - with Reverse Heat - Keep cool on a hot summer day, or warm up on your crisp morning ride. Dinghy Launch/Retrieve System - Enjoy easy launch and storing with a motorized retrieval system. Electric Shore Cord Reel System - Easily store your shore cord when you're ready to leave the dock. 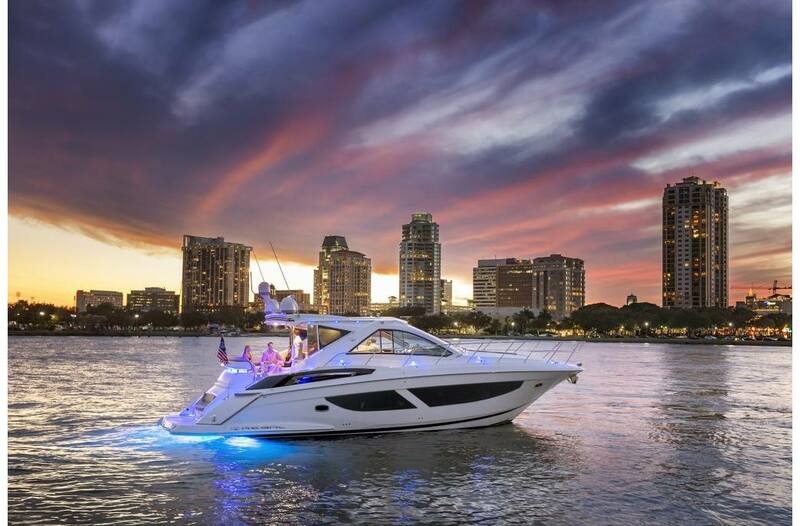 Florida Water Delivery with Factory Assistance - Enjoy the warm Florida weather as our company captain delivers and assists you with your new Regal Sport Yacht. Gray Water System - Grey Water System drains all grey water into holding tank. SeaKeeper 9 Stabilization System & 15 Kw Generator Upgrade - The Seakeeper's gyro stabilizer systems virtually eliminate boat roll. Rigid Dinghy with Electric Engine - Cruise into the beach or crowded harbor hassle free with this sturdy tender. Dishwasher - Eliminate clean up time and enjoy your night. Washer & Dryer - Dry wet towels and keep clothing fresh and clean. Belgian Linen - Lightweight, luxurious and soft to the touch. You will feel right at home when you experience the comfort of Belgian linen. 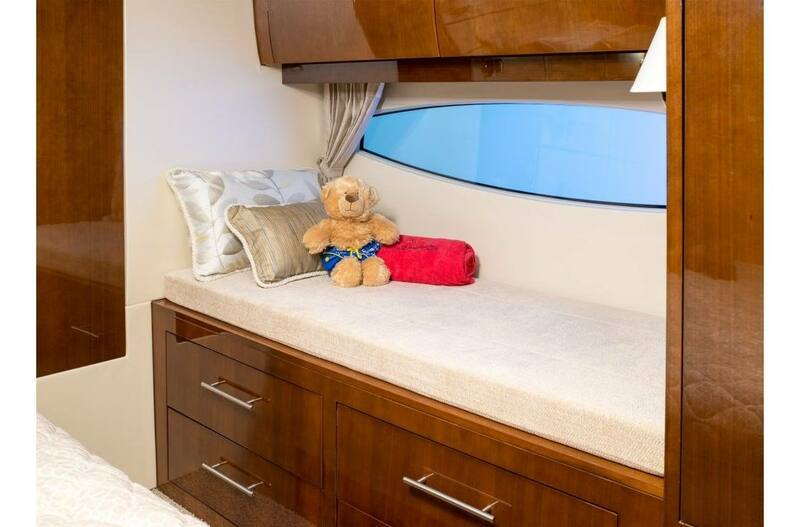 Cushions For Dresser Tops - Port and Starboard cushions add comfort to your stay on-board. Settee in Master - Relax with a warm cup of coffee or cozy up with a book on this comfortable sofa. 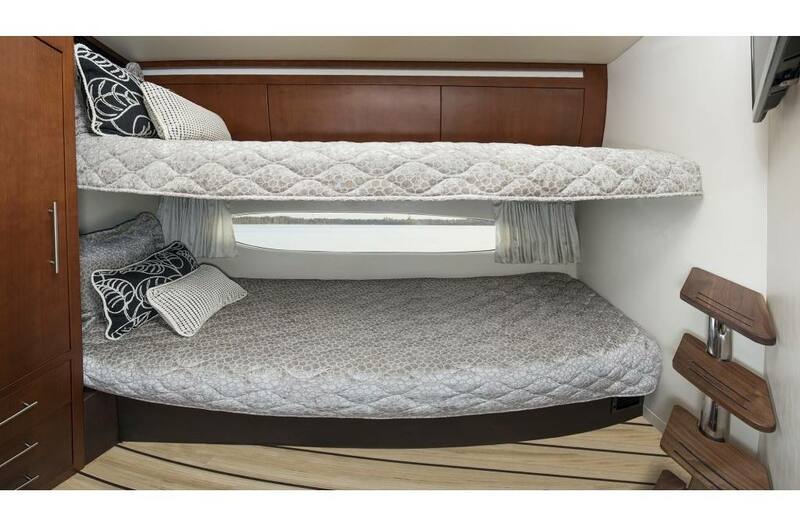 Third Stateroom with Twin Bunks - A third stateroom option with twin bunks gives the family more flexibility when it comes to the sleeping arrangements. Birch - Add texture and unique richness with each earthy colored plank. Carpet - Stay cozy with soft, plush carpet. Classic Walnut - Enjoy the warm, classy look of walnut wood. Forward Stateroom with Double Berth & Bunk Bed - Enjoy a spacious full-sized queen with innerspring mattress as your child safely sleeps in their own bunk alongside. Forward VIP Stateroom with Queen Berth - Enjoy all the comforts of home with this spacious stateroom featuring a large Queen berth with innerspring mattress. Aft Patio Awning by SureShade - With the touch of a button extend and fully shade the aft patio or retract shade to sit back and soak up the sun. Palm Beach Aft Patio Enclosure - Quickly and easily increase your shade to keep the sun off the aft upholstery or cool the entire cockpit. Bar with stools & transom bench seat - An aft patio layout option that is perfect for entertaining your guests. Wraparound Seating - Breath in the fresh air while enjoying the company of friends and family. Electric Pedestal Teak Table - With the push of a button raise and lower the height of the table, hand-crafted out of teak wood. Tuscan Horizon - Plush, two-toned blend of off-white and light tan. Front & Side Window Covers - If you're looking for some extra privacy or just looking to keep heat out of the cockpit, the windshield cover is what you need. Aft Bimini & Camper Enclosure - Keep cool during hot summer afternoons and be prepared for unexpected weather with full enclosure of the aft cockpit area. Cockpit Pillow Package - Cozy up in the upper salon with the cockpit pillow package. Helm Seat - Electric Lift - One size fits all. Icemaker - Don't limit yourself. 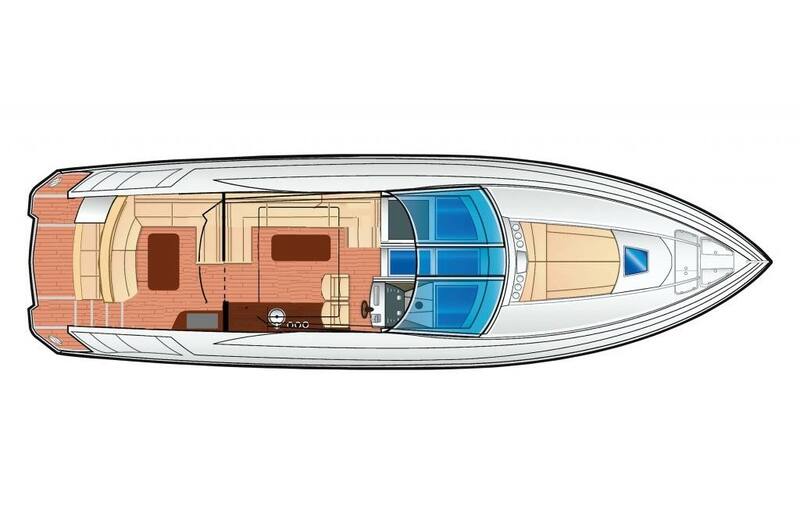 Teak Inlay - Aft Cockpit Patio - Take your boat to the next level with this boater-favorite look. Teak Inlay - Cockpit Stairs - The teak addition gives the cockpit a classic earthy look. Companionway Screen Door - Shut the screen door for some extra privacy without losing all of the natural ambiance. Foredeck Chaise Sun Lounge & Cover - It's the best spot on the boat. Side by Side Refrigerator - The built-in upper side by side refrigerator makes even the largest social gatherings a easy and fun. Cockpit Refrigerator & Wine Captain - The built-in upper galley makes even the largest social gatherings a success. Blinds with Windshield Privacy Covers - Enjoy private evenings in the upper salon. Electric Pedestal Hi-Gloss Waterproof Table - Enjoy a mid-day meal with the family. Full Length Sofa - Gather together to watch a movie with the whole family. Cockpit TV 50" - Electric Lift - Watch innovation at it's finest as the 50" HD TV rises from within the countertop. Forward Stateroom TV - The LCD TV with DVD player is a perfect way for the grandkids to wind down at the end of the day. Premium Sound Package - The ability to feel as if you are either in the movie theater or in a dance club, the premium sound package creates the sound you need. Satellite TV - KVH, no reciever - Stay connected. Satellite TV - wire for second master stateroom reciever - Stay connected. 2nd Garmin GPS 8212 Chart Plotter - The fully integrated, 12" touchscreen GPSMAP 8212 Chart Plotter is one of the most technologically advanced, easy-to-use MFDs ever offered. Garmin Depth/Fish Finder - The GSD digital sonar ushers in the next evolution of sportfishing technology, providing unrivaled target separation at far greater depths. Satellite Marine XM Weather - Always prepared for what lies ahead.